Won a prize on how cool is that…. When I wrote my reaction on Michelles site, I was already thinking: I have a feeling that I am going to win. To my own surprise I really won! Do you believe that??? It is really weird ;-)) Now I am lying on my doormat, waiting for the surprise to arrive… How long would that take, you think, coming from the US to Holland (Europe)?? By the way, don’t you think it is cool I was allowed to use the announcement of Michelle’s site?? One of my friends lost her mom. They had just found out she was ill, and next thing she is dead. Although their relationship was not easy, she misses her mom terribly. I made a card (right side of page) for her, that I scanned and used as starter for this page. I randomly selected a little text, guess what? I choose “How do I love thee? Let me count the ways.” Cannot be coincedental as my friend felt so sorry not asking her: do you love me? Jose, OFF COURSE she did. The clock is there to remind you that you never know what time it is. And the butterfly is for our spirit, that will not pas away, but goes to heaven to our beloved creator. My muse… ON the go for MY first crusade! Okay, what aRe My mUses? Every day life is one of my muses! 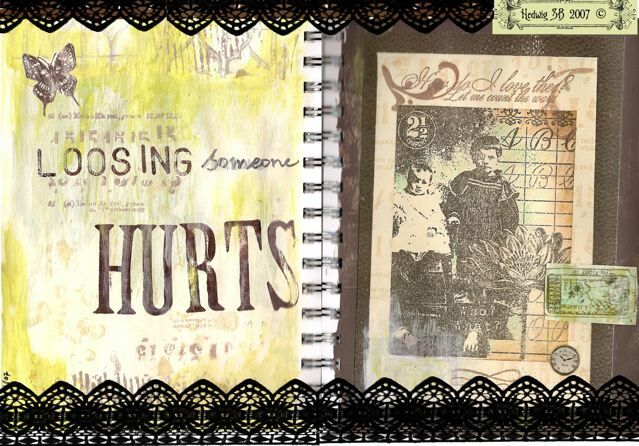 As a journaler I use my experiences, feelings, doubts in my journal pages. Another muse (muse sounds very romantic, this one is not romantic…) of mine is the internet! I mean, how would I know al these great artists without internet?? Learn new techniques, be able to buy materials in Holland, but also in the States and Australia?? Find beautifull pictures, artist’s magazines…. If I my inspiration is low, I go on the net! And of course, what would i be without the yahoo groups i join?? ANd now a muse you expect when you here the word MUSE. For me Leonarde da Vinci is a real inspirator. 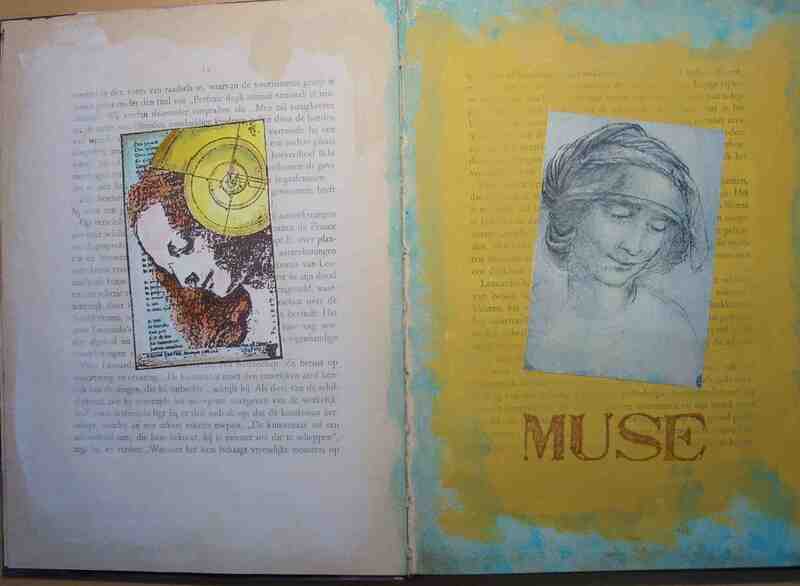 In August I made an altered book on Leonardo, on the first page, calling one of his drawings litteraly MUSE! 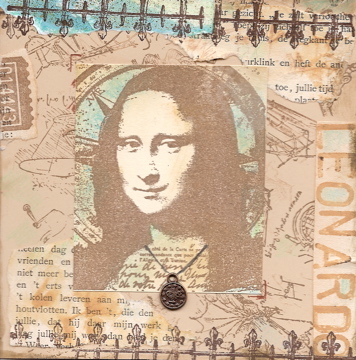 Here is another exhibit of Leonardo being my muse…. And then some more contemporary inspirators! Michelle, you definitly are! On your weblog I read about cool books, great techniques and find beautifull art. Mary Todd Beam is another inspirator, she learned me to use several gel medium to create new surfaces for my art work and…. 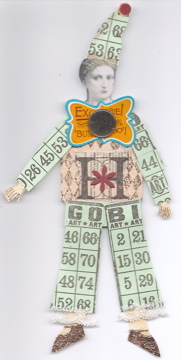 she pointed me to use stamps in my artwork. ThNx. And then there is Lynne Perella. 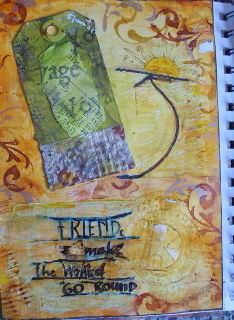 Reading her book Artists journals & sketchbooks I found out there is something called “journals”. Never knew that what I liked, had a real name and was something others did too! Last I want to honour here are Linda Wood and Karen Dinino for making journaling within reach for everybody! Okay, maybe two last muse: not persons, but companies: I admire Ranger for making such a great new products all the time! And off course Stampington for making great magazines like Somerset Studio and nice projects on their site. Met de mixed media diva’s yahoogroep meegedaan aan de HeRFstUitdaging. Je krijgt dan een pakketje met materialen waarvan je iets maakt (DAnk ELly). Het was in elk geval de bedoeling dat je de huisjesvorm (3 x klein, 3 x groot) zou gebruiken. Eerst dacht ik aan een schrijn met een vogel. Maar in nieuwste Somerset Studio zag ik iets dat me nog leuker leek. En dit zijn ze dus geworden! 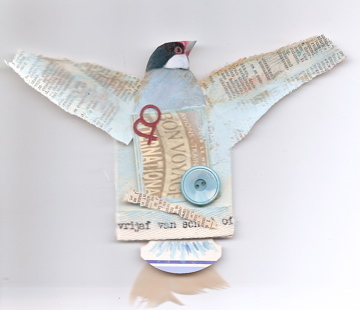 Een vogel, een harlekijn en een engel. Waarbij het lijf gemaakt is van de kleine huisjes uit het pakket! * I am showing the results of the AutUmn ChAllengE) of a mixed media group in Yahoo. We received a package of material and the idea is using this material (THNX Elly) (and of your own). 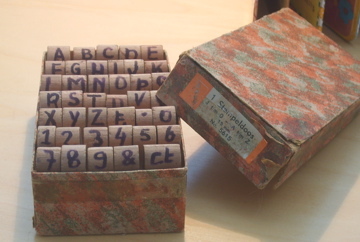 One thing you had to use were little and some bigger houses of paper. 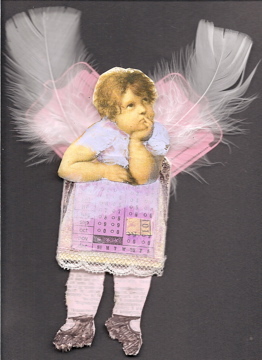 I used the little ones to make a harlekin, a bird and an angel. Most of the material is from the package, a little is from me! Hier is dan het traveljournal dat ik maakte op de Gran Canaria. Plezier met kijken! 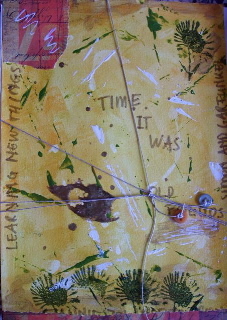 *This is my traveljournal I made on Gran Canaria. Have fun watching it!